The Jesus Stories to be released for FREE on WhereJesusIs.com! The modern parables of Jesus Josephovich are now going to be released, one chapter at a time, on WhereJesusIs.com beginning on June 1st! These stories are too valuable not to be shared with the whole world. Every day for the next two months, a new parable telling the story of where Jesus visited Ukraine in modern times will be posted on the site until the book has been published in its entirety. All 60 Jesus in Ukraine parables!!! These are being released under a Creative Commons Attribution-NonCommercial-NoDerivs 3.0 Unported license, so that anyone at any time can read the Jesus Josephovich stories and be inspired. Share them with your friends and loved ones, post them on facebook, link to them on Twitter, give the gift of inspiration, laughter, and love to all around you. Comments Off on The Jesus Stories to be released for FREE on WhereJesusIs.com! When the prisoners awoke in the morning, they awoke to an odd site that caused them to delay their typical cranky morning banter. Jesus Josephovich was sitting on the floor looking out the small barred window at the blue morning sky. His mouth was moving, but no sounds were coming out. His attention was so fully focused on what he was doing that the foreigner didn’t seem to notice that he was in a prison cell full of dangerous convicts. The men knew instantly what he was doing, and those who were more religiously inclined began to say their own prayers silently to themselves in the morning lull. The foreigner’s presence filled the room with an electric spirit, as if anything could happen, and those who prayed felt an especially close connection to God that they hadn’t felt since they were children. As Jesus finished praying, the door to the cell suddenly opened. The two large guards who had escorted Jesus Josephovich to the cell motioned for him to exit. The other prisoners jumped off their bunks and gathered around Jesus Josephovich. They laughed and pat him on the back with congratulations. “That was the fastest jail break I’ve ever seen,” the cell leader quipped. “I already have,” Jesus Josephovich said with a smile. “Pray for me too!” the other prisoners shouted as they laughed and bantered in amazement how this condemned man was suddenly free. Jesus Josephovich left with the guards and was quickly taken to a small room where they handed him his civilian clothes. He was then rushed out to the front of the prison where a car was waiting. Inside the car was the Warden. “Every moment is filled with the miracles of God,” Jesus Josephovich declared. Jesus Josephovich got into the old police vehicle and they sped off down the street towards the center of the city. The Warden looked at the strange foreigner out of the corner of his eye, as if to test whether this was reality or a dream. He took a deep breath and turned to Jesus. “Yes, I know,” Jesus Josephovich answered. “You won,” the Warden said, not believing the words himself. “I thought I couldn’t be elected Mayor because I am not a Ukrainian citizen,” Jesus Josephovich recalled. The car suddenly came to a halt at the end of Khreshatic boulevard, the main street that passed directly through the heart of the city. The Warden motioned for Jesus Josephovich to look out the window. An extraordinary image filled his vision. There on the street, thousands upon thousands of people were marching towards Maidan Nezalezhnosti, Independence Square. They were shouting, singing, and thrusting homemade signs into the air in unison. The majority of them were wearing orange T-shirts that said, “Jesus is my Brother”. Jesus Josephovich shook his head in blissful amazement. “Honk!” the Warden shouted, clearly not used to being told he couldn’t do something. “It’s ok, I’ll walk,” Jesus Josephovich said. He opened the car door and started to step out. Jesus Josephovich got out of the car and walked down the street towards the main gathering. The Warden nervously exited the vehicle, not sure what he should do. He was afraid of the crowd, but he didn’t know why. He took a deep breath and remembered what Jesus Josephovich had taught him. He tried to connect himself to these people, to stop judging them and to feel empathy towards them, to become one of them. The fear subsided like a fading mist, and as it dissipated he wondered if it had ever really been there at all. He gathered his strength and followed Jesus into the crowd. As Jesus Josephovich joined the crowd people began to recognize him. A group of young men lifted their Mayor elect onto their shoulders and moved him through the crowd. The crowd soon became too thick to walk through, and they passed Jesus Josephovich over the top of the mass of people like a crowd-surfing rock star to help him get to the front of the protest. Hundreds of thousands of shouting people filled Independence Square. An extraordinary energy was spreading amongst the people. They weren’t shouting out of anger or hatred. They were shouting out of love, peace, brotherhood, and hope. They were unified by something bigger and better than themselves. That indescribable feeling of brotherhood that many had felt during the Orange Revolution was back, only it was even more powerful. This time the people weren’t merely putting their hopes and expectations in a political party or politician. This time the people put their hopes and dreams in their own hands. They were ready to change their country. They were ready to change themselves. They were that change. When the protesters noticed Jesus Josephovich being carried across the crowd an ecstatic cry rose over the square. Jesus Josephovich managed to stand up and began walking over the top of the crowd. They had never seen anything like it before. No one knew if he was stepping on people’s shoulders or heads, or if he was miraculously floating above the crowd, but the sight of Jesus rising above the confluence sent the people into a near hysterical pitch. Nothing like it had ever been experienced before, not even during the Orange Revolution. The people were not merely witnessing a miracle, they were a part of it. Jesus Josephovich walked all the way to the center of Independence Square where a large stage had been set up for the new mayor to make his speech. 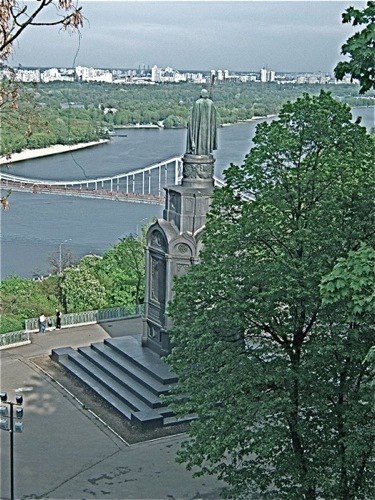 The stage was directly in front of the Maidan Nezalezhnosti statue, Beregenia, or as the people of Kiev affectionately referred to her, Baba, who overlooked the entire square from her perch on a magnificent white column a hundred feet above the ground. A flock of golden doves floated between her outstretched gilded wings sparkling in the afternoon light. As he climbed onto the stage he saw Volodomir and his family standing next to the large curtain on the side. “Jesus!” they shouted, as they ran to hug him. “You’re free! How did this happen?” Volodomir shouted. “Did you break out of prison?” Leosha wondered. “I’ve been trying to call you all day but there was no answer. Why didn’t you text me that you got out of jail?” Katya questioned. Jesus smiled and looked out at the crowd spilling into Independence Square. It was completely packed with protesters from one end to the other, but people continued pushing forward to get a glimpse of their hero. “How did this happen?” Jesus Josephovich wondered. “Is this true?” Jesus Josephovich asked. Jesus Josephovich looked out over the crowd and noticed many of the people he had met in the city. He nodded to the cab driver who had rallied all of the taxi drivers in the city to come to the square. He waved at Ivan and the homeless men who no longer drank alcohol, and whose group had expanded to hundreds of sober comrades. He smiled at Kolya the computer hacker who had created his Ukrainian passport and was now surrounded by a large group of programmers who he had told about his experience. They, and many others that he had touched, were shouting and raising their hands in victory. The Politician whose son Jesus Josephovich had healed rushed onto the stage with Talia, the PR agent, and shook hands with the new mayor elect. They were both eager to get their photos taken with Kiev’s rising star. Jesus Josephovich thanked them and walked over to the Politician’s son, Sasha, who was enjoying the use of his legs by kicking a small soda can around at the side of the stage. “Go? Go where?” Sasha cried out. Jesus Josephovich tried to speak into the microphone, but only the piercing sounds of electronic feedback spat out of the speakers set up around the stage. They weren’t quite ready for such a monumental speech. “That’s ok,” Jesus Josephovich said, “I’ll just speak from my heart.” He winked at the stage manager, who had no idea what he meant, and walked off the stage disappearing behind the large curtain. “Where is he going?” Talia shouted. Everyone simply shrugged their shoulders. Suddenly, the large crane that had been used to assemble the stage moved up over the curtain with Jesus Josephovich standing on the rising platform. Talia screamed and the others shouted in surprise as Jesus Josephovich was lifted to the top of the massive white pillar on which the symbol of Ukraine’s independence stood. He stepped off the crane onto the top of the pillar, sharing the space with the angelic statue. Directly across from him he could see the other angelic statue of Arch Angel Michael hovering over the masses at the other end of the square. He took a deep breath, marveling at the site of hundreds of thousands of people gathered together in unity and love. Thousands of “Jesus is my Brother” t-shirts stared up at him from the street below. They were so close, he thought. So close to becoming a family. It was right there written over their hearts. He prayed that they would see it. The crowd reached a fever pitch as Jesus Josephovich held his arms out over the crowd. The people chanted and cheered louder than had ever been heard in all of Ukraine. The sound of the crowd was so loud and powerful it became like a single voice, a deep resonating presence that each participant heard and felt, yet was a part of. He raised his arms in the air once again and the crowd quieted down. He began to speak without a microphone, but to each person in the square it sounded like he was standing right next to them, speaking directly to them. A hush fell over the crowd. The square was instantly silent. The protesters smiled and laughed as the thought filled their consciousness. “The great secret that I want to share with you is this: You are winning. Goodness is winning out over evil. The whole world is making progress. Slowly but surely, as water carves a path through the hardest stone, not merely religions or cities or even countries, but the whole world is advancing towards the final goal. “I tell you, people of Kiev, you are winning. The problem is that you live like you are losing, needlessly entangling yourselves in destructive behavior as if it didn’t make any difference. “It does make a difference. Everything you do makes a difference. Individually, you have far more power to recreate this world than you ever imagined, and together you have unlimited power. Even your thoughts have power. “Humankind has reached such a stage in its development that even the things inside of our minds can become a reality. Now we can share these things that are in our minds. I can take my perspective, what I see, and through your technology I can turn it into a physical object, a photograph, a video, music. My thoughts, experiences, and perspective, the objects of my mind, become physical objects in the real world. These objects can be shared with other people, and my thoughts can be transferred directly into their minds. We can share each other’s thoughts and experiences. We can begin to understand each other, to shape our minds closer together towards a unity of all mankind. “Life is simple,” Jesus Josephovich stated. “Truth is simple. Imagine that when you go home tonight you cannot take the money that is in your pockets, and you cannot keep the groceries in your car, or the cell phone in your hand. Imagine for a moment that you cannot take your possessions with you when you leave this place. Imagine that every thing that you own, even the clothes on your back, will be gone. “What then, I ask you, is of real value? “Imagine that nothing is yours. Imagine that everything on this planet is only in your possession temporarily. You have nothing connected to your name, no houses or apartments, no cars or bikes, not even a garden. Everything is a gift, and that gift is meant to be passed on and on, and if it is not passed on it will be taken from you. “Imagine that there are no boundaries, no barriers between people. There are no laws or walls separating us. There are not even countries or nationalities. Imagine that when you leave this place you cannot take any physical distinctions home with you. “What then, I ask you, do you have left? “When everything temporal passes away, what remains from our lives? What carries on that did not exist before? Only one thing, that is: our relationships. “The only thing that no one can ever take away from you, the only thing that will last beyond this fragile moment called our lives, is the relationships that we build with one another. “Every relationship you forge, no matter how small, connects you to others in a way that can never be broken. Your influence on other people can change them and can influence their children, and their children’s children, forever. It is not with money that the world will be changed, it is not with science and discovery, it is not with political maneuvering, nor with military might. “It is with a wave of love, of true relationships, that grows so swiftly and strongly that it cannot be stopped. Real relationships change the participants. Each person is strengthened and in turn molds and strengthens the other. The more relationships you add, the more each person’s position changes, and the stronger each person’s position becomes. “The power of each man and woman will be lifted higher and higher through each relationship they build, and in turn lifts higher every person they touch until entire families, communities, and even nations are lifted to a position of such extraordinary power that no amount of money, no solitary philosophy, and no hardened army could ever break its ties. Nay, I tell you even death cannot break it. “Therefore I tell you, seek out this one thing more than gold and silver, more than homes and jobs, more than knowledge and titles. Strive with all your heart not for things that pass away even while in your possession. Seek with everything in you the infinite power of a connection to your fellow man. It matters not who it is. May it be a mother, or a father, a brother or a sister, a son or a daughter, a wife or a husband. May it be a friend or foe, a master or slave, a king or a peasant. “And one day you will realize that in building these relationships, you have built a relationship with God, a connection to the creative force in the Universe. As you learn to be connected to other people, you will learn to be connected directly to God. And in the end, your relationships will reveal to you the fact that we are already connected. It will reveal who you really are, not just your solitary self, but all of us together; that we are already intimately connected to God and that connection cannot ever be broken. The crowd applauded and a voice rose up from the center of the square. Someone was singing. More voices joined the song and within moments the entire square was in complete harmony. As the people in the crowd looked at one another and searched for the source of the song, they soon realized that Jesus Josephovich was no longer standing on the statue in the center of Maidan Nezalezhnosti. The two angelic statues proudly stared at one another across the square, but Jesus was nowhere to be seen. As softly as a whisper on the wind, Jesus’ voice sounded in their ears one final message of hope. “One day all our minds will agree. They will all agree about the same fundamental things. They will take the same shape and they will sing the same song. But it will not be a single voice. No, it will be a choir. There will be bases and tenors, altos and sopranos, brass instruments and winds, strings and percussion. And when all minds are alike, the world’s voices will harmonize. We will all sing together a glorious song that will sound like the great trumpet on the last day. But it will not be the last day. It will be the first day. The first day of a new world. But not the physical world that we call our home. No, this new world will be a new inner world. The world inside each one of us. As the voice faded away, Volodomir grabbed his family in a warm embrace. That feeling he had longed to feel ever since the Orange Revolution had returned and had filled his heart to a degree he had never known possible. But it had nothing to do with his city or his country. This was a feeling for everyone. There were no more boundaries in his mind. He knew he would never be the same. Ukraine would never be the same. The world would never be the same. The next day Jesus Josephovich’s cell mate was abruptly awakened by the slamming of their prison cell door. Instinctively he leapt to his feet, almost falling off the tiny cot. He was surprised to see that the foreigner was not in his bed. Turning around he saw that the foreigner was on his knees looking at the sky through the small crack in the wall that they called a window. Three guards stepped into the cell like landlords about to expel an unwanted resident. “Jesus Josephovich,” one of the guards said. The foreigner calmly arose and turned to greet several large guards with grizzled faces. “Good morning comrades,” he said. The guards did not look like they were having a good morning. The largest of the guards stepped forward and looked at the odd prisoner. He was a relic of the Soviet era with a huge head and thick neck supported by a massive torso that was made even more intimidating by the wide uniform covering his square shoulders. His fists were the size of a large grapefruit and his fingers were mottled with scars. He was a man that time had petrified into a living stone. “Go with them,” the muscular guard barked. The other two guards grabbed the foreign prisoner by the arms and led him out of the cell. They lead him down the hall and placed him in an empty cell. The imposing guard entered the cell behind them. He nodded to the two guards and they left without a word leaving the intimidating guard alone in the cell with Jesus. The cell locked behind them with an ominous clank. Jesus Josephovich smiled at the old guard. The man did not smile back. He looked around the room as if he were searching for something and suddenly, as if a great weight had fallen from from his shoulders, he sighed and sat on the cot in front of the prisoner. Jesus nodded his head and bowed slightly, politely acknowledging the man as if the Warden’s position were of no consequence to his current state. The Warden cleared his throat. “I believe in God,” he stated, implying much more than he said. “I see,” Jesus Josephovich replied. Jesus Josephovich nodded with a grin and the Warden cleared his throat again. “I was a very disciplined child. My father was a police officer. He was very strict. I had to run and exercise every day, and I had to do many chores. Much more than other school children. My mother was strict as well, but it was different with her. My mother was happy when I did my chores, but most of all she wanted me to obey the Bible. She was very strict about the Bible. I had to memorize all the books, and the Ten Commandments, and the sins, and the fruits of the spirit, and she made me promise every day that I would not commit any of the sinful acts. He looked up into the foreigner’s eyes. He saw something more than compassion. It was a deep understanding in Jesus’ eyes, as if he had been there himself. A tear cascaded down Jesus Josephovich’s left cheek. The Warden chuckled deeply. “That is the question. I’m not sure what is wrong with me, but I am certain something is wrong. I became a cop. I wanted to do what my father could not. I wanted to be an honest policeman. I was very good at catching criminals and punishing them for their sins. I soon became the Warden of this prison. “You are the law,” Jesus Josephovich said. “In here, I am,” the Warden said with a grin. “And how do you feel?” the foreigner inquired. “When are you happy?” Jesus Josephovich asked. “When I am with my children,” he answered, as if it were too simple an answer to be correct. “And what is it?” the Warden wondered. The Warden leaned back against the wall, stunned at the question. It took him a long time to answer. It was not something a man like him ever considered. “At my mother’s funeral,” he realized. Something uncomfortably deep began to tug at his heart. The Warden suddenly stood up, towering over the skinny foreigner. He was insulted by the allegation that he had missed such an important lesson in life. He was certain he already knew what it was. The Warden folded his bulging arms in front of him. “So what am I missing?” he asked with contempt. Another tear cascaded down Jesus’ opposite cheek. The Warden lurched back onto the cot and sat with his back against the wall. His face turned red as thoughts whirled through his mind. Crying went against everything he stood for. It went against his job, his hatred of sin, and even against his very ideals of manhood. He had built such a strong wall of strength and stability within himself to protect him from the outside world that he didn’t think it was possible to teach himself to cry. He didn’t have sympathy for himself, how could he have it for others? “I don’t understand,” the Warden admitted with great frustration. “Their pain?” he asked in shock as he indicated to the other prisoners. Jesus Josephovich stepped forward and placed his hand over the Warden’s head. He paused for a moment, as if to make sure that this beast of a man could endure what he was about to show him. Then his fingers touched the man’s forehead. A feeling of rapid expansion overwhelmed the Warden’s senses as his consciousness suddenly enveloped the entire prison. Lifetimes of thoughts, feelings, and suffering flowed through his shattered mind. His own body evaporated in the ocean of feelings and experiences from hundreds of criminals who he had learned to hate with the calm certitude of religious righteousness, and for a brief eternal moment he was each of them. He saw the abuse that had been done to them, he felt the confusion in their minds, and he experienced the agonizing decisions that had led to their criminal acts. More than anything else, he was overwhelmed by their utter hopelessness. Without warning he was jerked awake from the dreamlike vision, and his body inhaled as if it had been under water. He fell to the floor on his hands and knees trying to catch his breath. Then sobs and wails uttered from his bowed head and tears splashed onto the concrete. Jesus Josephovich knelt on the ground before him, held his hands and cried with him. The Warden wept as he had never wept before. Decades of emotions flooded through his body and mind. He couldn’t breathe, he couldn’t speak, he couldn’t even open his eyes. There was no action that could be taken. He could only cry. The Warden’s powerful back and chest heaved in rolling waves of anguish, expressing a sorrow that few men had ever known. And yet, as the tears subsided, he was filled with an immeasurable joy. He had emptied himself, and something new had filled him. Peace. His face and hands were soaking wet, baptized with his tears, and as he stood he hugged the foreigner in an embrace that would crush a bear. He kissed Jesus Josephovich on either cheek, as if greeting a long lost brother, and as they looked each other in the eye after that extraordinary bout of wailing, they both began laughing through the last few tears. “Do you think you can cry now?” Jesus Josephovich inquired. “I will,” he promised. “You have given me more than I ever imagined. What can I give you? Let me set you free,” he said pointing to the iron door. The lights from a thousand cameras lit up the night air like a volley of rifle fire as the police opened the car door and pulled Jesus Josephovich, Kiev’s most popular man, out of the car. The police handled him roughly, as if trying to break the serene calm on his face, but the foreigner never even blinked as he was dragged into the prison. He didn’t seem the least bit worried. It was as if he had suffered through such injustice before. After the Oligarch showed up at Volodomir and Elena’s for supper and demanded that Jesus Josephovich choose imprisonment or partnership, the foreigner had proceeded to wash the dishes while explaining to the Oligarch the importance of servant-hood to any great leader. Unfortunately for the Oligarch, this did not mean that Jesus Josephovich would serve him. Jesus was not a part of any political party. The choice had been made. 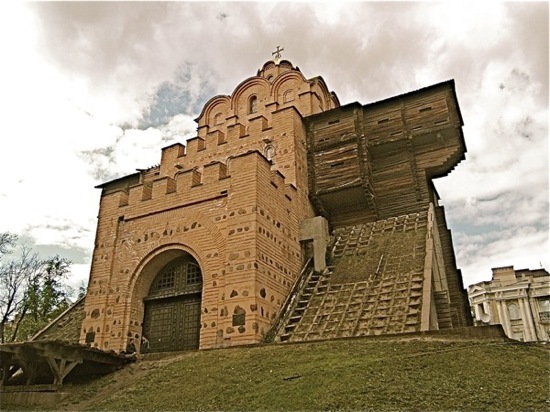 The crowds around the prison were very upset, and shouted unmentionable insults at the police and politicians who were leading Jesus Josephovich through the massive faded yellow walls covered with rusted barbed wire. It was clear from the outside that this was not a place where a man got a second chance. This was a place where men went to die. Even if a man’s body escaped this dark place intact, his sanity would not. The police pushed Jesus Josephovich through several gates and stopped him in front of a fat man behind a soviet era desk proudly wearing a uniform that appeared equally dated. The man looked at them with blank eyes that didn’t seem to see what they were actually looking at. “I don’t have any,” Jesus Josephovich replied. Jesus Josephovich emptied his pockets. The only thing he had with him was the new cell phone that Katya had given him. They took it from him and checked his pockets again to make sure that nothing else was hidden there. When the signing in was finished, the guards pushed him through several more gates and long decrepit hallways until they reached the cells. When they opened the door, the foreigner could hardly believe his eyes. The holding cell was only 10 feet by 5 feet, and there were 6 men inside. Bunks lined the walls where 4 men were sitting, and a few prisoners were sitting in tiny chairs at the front of the room. They all stared guardedly at the long haired, bearded foreigner as he stepped into the room. The guards pushed Jesus Josephovich all the way into the cell. He stumbled and the prisoners laughed. This one was weak. He would be easily broken. Jesus Josephovich turned to the other prisoners and smiled at them. The prisoners were confused by their new cellmate. A smile was a sign of weakness, but his calm demeanor showed that he was not weak. They guessed that he was probably insane. The eldest of the group, a ragged and wrinkled old man, walked over to Jesus Josephovich and introduced himself as Gennady. The others acknowledged the new prisoner with a nod without looking into his eyes. Their faces wore apathetic stares, as if to protect them from any and all emotions that they might occasionally be inclined to feel. They looked like the living dead. All the prisoners had shaved heads and most were shirtless. They were covered with ornate tattoos on their chests, shoulders, backs, and even hands. The ink on the tattoos was not like that of ordinary tattoos. The ink was thick, faded and bluish, and the designs had clearly been drawn by hand without any guidance. The leader of the cell was leaning in a chair against the back wall. To illustrate his power he addressed the foreigner with a squinting half grin, like a man about to sell a customer a broken watch. “You can sit on the floor,” the cell leader ordered. “Thank you,” Jesus Josephovich said pleasantly, as if he had been offered something special. He sat cross legged on the cold concrete in a meditative position. His cell mates couldn’t help but stare at his odd behavior. “Your tattoos are quite striking,” Jesus Josephovich complimented. The cell leader chuckled smugly. Gennady, the old man, scooted his tiny chair closer to the foreigner to show off the only part of his body that still had any aesthetic value. His skin was so wrinkled that he had to pull it tight to reveal his tattoos. Even then they were so old that one could barely make out the faded details. The homemade ink had bled into the surrounding skin. The old man pointed proudly to his heart. Over his heart was a crudely drawn bust of Lenin. He saw that the foreigner recognized it and smiled. On his lower back were two rough drawings of Stalin. The one on the right side appeared to be an idyllic drawing from a propaganda poster of Stalin’s younger days, and the one on the left showed the dictator in full military fatigues. “You see?” he asked enthusiastically. “I made these tattoos so the guards would not hit me in the heart or kidneys,” he explained. “It worked. No soviet officers ever wanted to deface a picture of Stalin or Lenin.” He laughed the whispered laugh of a man whose only pleasure was recollecting the past. “But now there is no more Soviet Union, and the tattoos don’t work so well to protect me.” He slowly slid his shirt back over his frail frame. “Gennady is a coward,” the cell leader spat. The brawny inmate stood up to reveal his entire chest, stomach, arms, and back covered in detailed symbolism. He turned around and revealed an intricate tattoo that covered nearly his entire back. Jesus Josephovich was amazed to see that it included the virgin Mary holding baby Jesus in front of a church with several towers. “Are you a religious man?” Jesus Josephovich asked. “What was your crime?”the foreigner wondered. The young man’s forearms were covered in tattoos as well. He had clearly changed since being put in the prison. The cell leader acknowledged the foreigner’s correct answer with a disinterested grin. The inmates laughed as they examined the odd looking Middle Easterner. Two large inmates walked over to the skinny foreigner, grabbed his arms and lifted him to his feet. The rest of the cellmates laughed as they pulled his shirt off and tossed it to the ground. Suddenly their faces fell and they moved away from him towards the back of the room. The entire cell went silent. Scared flesh trailed all the way down and across Jesus Josephovich’s back like a mountain range on a topical map. The scars were several centimeters thick and they wrapped around his entire upper torso; a twisted tapestry of pain. Some of them curled over his shoulders and lower back onto his stomach and chest like the claw of a beast. The inmates were afraid to speak. They could only imagine what might have caused such wounds. This was a man who had experienced inhuman suffering. The inmates didn’t dare answer. The inmates looked around the room uncomfortably. Gennady nodded in agreement. The old man understood that many of his worst decisions in life had been made out of a reaction towards something else. They were actions he would have never considered taking under normal circumstances. The young man imprisoned for stealing a cell phone began to cry. The other inmates looked away from him for fear of seeing their true selves. Jesus Josephovich touched the young man on the shoulder. “Freedom is not here,” he said motioning his arms to the cell. “True freedom is here,” he said pointing to his head, “and here,” pointing to his heart. The young man nodded as if he understood. The inmates looked at the markings on their skin and realized for the first time that they had created these images. They had chosen them and designed them and drawn them. They had created who they were. The guilt of their entire lives flooded into their minds and they realized the responsibility that they had for themselves. Most of them had always believed that other people were responsible for who they had become. The knowledge that it had been their decisions and their own reactions that created their current circumstances was almost too much to bear. However, there was a glimmer of hope that shined from this gnarly haired foreigner into the consciousness of each prisoner. If they had created their current state of being, then they could change it. They could become whoever they wanted to be. That thought swelled in their minds, as if whispered to them by a ghost. Gennady walked over the Jesus Josephovich and grasped his hand. “Why are you in this prison?” he asked. Jesus Josephovich and Abraham entered Volodomir’s apartment carrying several large bags of groceries. They hauled the bags into the kitchen where Elena was already preparing things for the meal. “Excellent,” she said when she saw the food. “I’ll be able to prepare enough for a dozen people,” she joked. “Do you mind if I invite a few more guests?” Jesus asked. “There will be enough food,” Jesus Josephovich assured her. Somehow she didn’t doubt him. That evening the house was crowded with guests and the sweet smell of borsch, vegetables, and fried chicken cutlets filled the cozy apartment. Everyone sat around the large table that Elena had prepared. Volodomir, Elena, and their children sat around one end of the table next to Jesus Josephovich, Abraham, Andrey Bogdonovich and Volodomir’s boss Irina. On the other side of the table sat the other guests that Jesus Josephovich had introduced. There was Kolya the computer hacker, Talia the PR Agent, The Politician that Jesus has healed, and Ivan the homeless man from Khreschatic. They all appeared to be slightly nervous eating dinner with Jesus Josephovich. They weren’t sure why they had been invited, and you never knew what was going to happen when he was around. The food was served and wine was poured in each glass, plus some grape juice for the children and Ivan who had recently gone sober. Volodomir held up his glass at the head of the table and the others did the same. “It is a tradition in Ukraine to make a toast,” Volodomir said. “First of course I would like to thank my beautiful wife Elena for this wonderful meal.” The guests agreed heartily. “Na Zdorov’ye,” the guests repeated as they toasted their glasses and sipped the wine. “Can I do the third toast, dad?” Katya interrupted. The guests laughed at the girl’s youthful enthusiasm. “How many toasts are there?” Jesus Josephovich inquired. Jesus Josephovich looked at the wine bottles on the table and imagined that they might have to empty all of them to get through 12 toasts. No wonder Ukrainians drank so much. “The third toast is always Za Lyubov, ‘To Love’,” Katya announced as she elegantly clanged her glass of juice against her father’s wine glass. “To Love,” they shouted, and finished the third toast. “Thank you Katya,” said Volodomir. “Can I say one too dad?” Leosha asked. “It’s not Christmas time,” Katya shouted as she elbowed her brother in the side. “It’s the only big toast I know,” Leosha said. The guests laughed at Leosha’s holiday toast, and clanged their glasses together. “Ok, now it’s time for a serious toast,” Ivan said, raising his glass. The old homeless man cleared his throat and stood tall, as if presenting a speech to the President. Ivan took a deep breath. “I feel like that man is me. God destroyed my life so he could rebuilt it better. Now I finally understand it. I was a homeless man with no hope. Now I have a purpose for my life. I am able to help others, and everywhere I lay my head is home.” He looked at Jesus Josephovich and raised his glass of juice towards him. “Thank you,” he said sincerely. The emotional guests raised their glasses in unison. The meal continued and everyone enjoy it greatly. As they talked and laughed and reminisced, each of them would periodically raise a glass for another toast. Some told elaborate stories, while others mentioned a single phrase. Abraham toasted to brotherhood, Andrey toasted to knowledge, Tania toasted to success, Irina toasted to humility, and Kolya the hacker toasted to the spirit and energy that connects all things. Finally it was the Politician’s turn. Feeling that he was the most important person present, he had waited to go last. He stood up and raised his glass towards Jesus Josephovich. “I remember the Orange Revolution, and what it was like to feel that we could change things for the better. That is how I feel around you,” he said to Jesus Josephovich. “That is the reason I got into politics. I wanted to change things for the better. I understand now that it is not simply politics that changes things. People must change. We must change ourselves.” He raised his glass higher. “To positive change,” he declared. The guests toasted their glasses. The Politician touched Jesus Josephovich’s glass last and held his eyes. Jesus Josephovich stood up from the table and held up his glass. He smiled and looked lovingly at each person who was present. “Do you know what the word ‘communion’ originally meant?” he asked. The guests looked at each other and shook their heads. A wave of peace suddenly filled the hearts of everyone around the table. They felt connected to each other at a deep, yet fundamental level. “They don’t want to look bad to the other guy,” Leosha suggested. “How do you start a revolution like that?” the Politician inquired. “To fellowship,” they declared as they toasted their glasses. When their glasses touched, a powerful feeling of energy surged through them and they understood that anything was possible. Their minds and spirits were in sync with the energy of the universe. They had become conduits of a higher power. Suddenly there was a ring at the door. Jesus Josephovich’s 12th guest had arrived. Lena opened the door to reveal the Oligarch standing with his body guards in the hallway. He handed his gloves to his bodyguard and entered the apartment alone. He looked at the group of gathered guests and frowned as he made eye contact with the hacker. Kolya quickly turned his eyes away from his boss. The Oligarch walked over to the table and grabbed a piece of bread. He dipped it into the bowl of soup that Jesus Josephovich was dipping his bread into, and devoured the small snack. “Unfortunately, I don’t have time to stay and eat with all of you. I only have time for one thing.” He glared at the foreigner. “Do what you came to do, my friend,” Jesus replied. “Thank you,” Jesus Josephovich answered. “The time has come for a decision to be made. Will you work with me and run this city together? What is your decision?” The Oligarch asked. “Let me show you,” Jesus Josephovich said. He stood up from the table and walked into the kitchen. “What are you doing?” the Oligarch asked. “I’m going to wash my disciple’s dishes,” Jesus said. After fighting through traffic that was causing problems for thousands of motorists for no real reason at all, the green Volkswagon finally pulled into a massive parking lot with hundreds of other cars all spread out before a giant glowing sign that read “MEGA”. Waves of patrons moved in and out of a row of doors beneath the sign like ants carrying their day’s plunder. “What is that building?” the Jesus Josephovich wondered as he stared at the warehouse sized structure. “That’s the store,” Abraham said. “That’s one store?” the foreigner replied. “They only sell food? It is larger than most temples,” Jesus Josephovich noted. They parked the car near the rear of the parking lot and had to walk half the length of a football field to reach the entrance. They joined a swarm of people pushing and shoving their way through the narrow set of double doors that flung open and shut with the wind. Inside the building Jesus Josephovich paused in awe as he took in the size of the structure. The ceiling towered above them like a steel sky and the aisles appeared at first glance to extend forever. As large as it was, the aisles were completely packed with shoppers. Many of them pushed carts in front of them that were the size of a small car, yet they still managed to load them with so much food that their items formed a mound that threatened to topple over the edges of the oversized baskets. “What do people need so much food for?” Jesus Josephovich wondered as an older woman passed them pushing a particularly overloaded cart. “You could feed five thousand people with less food,” Jesus noted as a cart filled with fresh bread and fish fillets squeaked by. Abraham grabbed a giant shopping cart and headed down one of the large aisles that were filled with food products 15 feet high. They began grabbing large boxes of food off the shelves as Abraham directed. Jesus Josephovich was amazed at the size of the containers. Each box appeared to contain several items. Apparently it was not enough to just buy what you needed. You had to buy ten of everything. The strange foods that he saw lining the aisles amazed the foreigner. Almost all of them seemed to be unnatural. Boxes and bags of chips and snacks or candies covered in plastic. The people who made these foods must have been more interested in covering the outside of their packages with beautiful designs, than with putting anything of actual value inside the containers. They made their way aisle by aisle, piling the food higher and higher in their cart as they went down the list of things that Elena needed to make her big meal. The foreigner wondered if their cart would get piled as high as the others around them. As they reached the end of the last aisle, Abraham heard a shout and stopped. “Abraham!” A voice behind them called. A young African man with a small beard hugged Abraham as the native shoppers walking past them observed the pair with interest. “Let me introduce you to a friend of mine. This is Tai-ye-wo,” Abraham said with emphasis. “Nice to meet you.” Jesus Josephovich hugged the young man, which brought even more odd looks from the surrounding shoppers. “His name means ‘The First to Taste the World’,” Abraham said with a laugh. “More than in any other tribe in Africa,” Abraham added. “They like to have two of everything,” he joked. “Well, you should be able to find everything you need in this place,” Jesus Josephovich said glancing at the cavernous ceiling. “What are you looking for?” Jesus Josephovich asked. “Are these for your t-shirts?” Abraham wondered. “Are you sure about that?” Jesus Josephovich questioned. “What do you mean?” Taiyewo asked. “Abundance. Isn’t that money?” Taiyewo asked. “What does that mean, it’s within me?” Taiyewo asked. Taiyewo was transfixed at the thought of infinite abundance flowing through him. The moment Jesus touched his shoulder he felt that familiar feeling of creative intensity that he always felt when he was making art. It began to flow through his mind and into his heart and suddenly it seemed to fill his whole being. Energy was flowing through every cell of his body and even beyond his body. An extraordinary amount of energy pulsed through him, and as he traced it back to its source within himself, he realized that it spread out from him like a web into the ground and sky and the air around him. The energy was flowing in and out from all directions at once. He was at one moment the conduit through which the energy flowed and at another moment the source of the flow. It was a connection to everything in the universe and he understood for the first time that he was not alone and he had nothing to fear. There was a source of infinite power that he could draw from and of which he was an eternal part. “Who is this guy?” Taiyewo asked Abraham, amazed by what he had just experienced. Elena was planning a big dinner that night, so she asked Jesus Jospehovich to help pick up groceries for the meal. Abraham, the medical student from Nigeria, was coming to eat with them and he was already on his way to pick up Jesus Josephovich. Abraham pulled up in an old green Volkswagon, the brakes squeaking loudly as he stopped next to the curb. “You have a car?” Jesus asked. Jesus Josephovich entered the vehicle. Abraham stared at him, but didn’t move the car. “Your seat belt,” Abraham said. “My what?” the foreigner replied confused. Abraham pulled his seat belt away from his chest to illustrate what it was and how to put it on. Abraham pulled the car out of the alleyway and into the crowded street where they immediately stopped fast in a long line of cars. The line stretched as far as Abraham could see. They both watched with interest as an equally frustrated driver who had just reached the traffic jam began to drive backwards. The car flew the opposite direction up the street towards the oncoming traffic, apparently assuming that they would stop for him. The car finally reached a small street and turned down it away from the traffic. “Hey, maybe that’s a shortcut,” Abraham thought. He changed gears with a grinding screech and the little Volkswagon lurched backwards towards the oncoming cars. “Are you sure this is a good idea?” Jesus wondered aloud as they drove the wrong way up the street. “I’m in Ukraine. I should drive like a Ukrainian.” Abraham winked. Cars weaved around them honking aggressively as their car made its way back to the small side street. They received a few angry looks, but to Jesus Josephovich’s surprise, many people began following their lead, hoping that they knew a shortcut. Car after car began driving backwards up the road, causing confused pedestrians to jump out of the crosswalk. Abraham drove the car up and over the curb to avoid a car that had stopped just at the entrance to the side street. Jesus Josephovich’s head bounced off the top of the car as they crashed down off the curb. The gears grumbled once more as Abraham put the car into drive and sped off down the small alleyway. They drove a few blocks down to the next intersection where they were forced to turn onto a larger street. They wound their way around over several hills until they came to the next main street, but their gamble had not paid off. There was a line of cars waiting to turn onto the main road, but traffic was so slow that none of them could turn. The cars on the main road made sure to follow inches behind the next car so that no one could merge in front of them. Abraham slammed his steering wheel with his fist. “This is even worse,” he shouted. “What do you want to do?” Jesus Josephovich asked unassumingly. Abraham sped the little Volkswagon through a maze of twisting turns and back alleys, driving the wrong way up a few of them, until he ended up near another major road. He drove with a kind of reckless precision that left his passenger unsure of the practicality of their “short cut”. As they approached the intersection, they could see cars moving by. It appeared not to be gridlocked. “Alright!” Abraham declared enthusiastically as they turned the corner onto the main street. He glanced over at Jesus Josephovich with a big smile on his face and gave his foreign friend another proud wink. But as soon as he turned his head back to the road he slammed on the breaks and the Volkswagon came to a screeching halt. “I can’t get away from it!” Abraham stated with frustration. Abraham ruffled his brow and stared at his odd friend. “By doing nothing?” Abraham expanded. The young man squinted his eyes, trying in vain to understand what the foreigner was telling him. He thought he understood for a moment, then lost his train of thought as the cars in front of him lurched forward. He exhaled fiercely as the cars once again came to a sudden halt. “Ok,” Abraham said. “School is good, but things are not getting better in this city. The crime is getting worse. Yesterday a friend of mine from Nigeria was punched on the metro. And two weeks ago a man’s wife was murdered in the park. She was African.” Abraham sighed a painful, hopeless sigh and looked straight ahead. “Do you want to change your skin color?” Jesus Josephovich asked. “Maybe I will get a gun.” Abraham looked at his friend out of the corner of his eye. “If they try to kill me – yes,” Abraham admitted. “Then what makes you different from them?” his passenger asked. “You hate them because they hate you?” Jesus asked. “Yes,” the student said, shrugging his shoulders and pulling the car a few feet closer. “But you believe that your hatred is justified, because you hate them for a better reason than they hate you?” the foreigner questioned. “Yeah, I’ve felt that before,” the driver admitted. “Then it’s amazing to think that all of mankind’s hatred could have been caused by a single man hating another man,” Jesus suggested. Abraham hit the breaks again and pondered what his companion had just said. It was almost too big an idea to fit in his head. “That’s interesting, but how does that help me? I mean, what if these guys want to kill me?” Abraham wondered. Abraham’s eyes opened wide and he slammed on the breaks again. “That’s crazy. I understand the idea, but it’s not possible.” He gripped the steering wheel tightly as a wave of emotion passed over him. Abraham froze like a deer in headlights, his heart halting momentarily like the cars before him. That is how he had always thought that the racists treated him, like an animal. “But it doesn’t make sense,” Abraham argued. “And if I believe I have a soul?” Abraham asked. “That death is not a failure. Death is not the end,” Jesus said. “What is death?” Abraham asked, not sure he wanted to hear the answer. “Not me,” the student admitted. Abraham pondered these things in his heart. After a moment he found another loophole and shouted it out almost joyfully. “But what about my family? What if I have children? I have to protect them. I don’t care if something bad happens to me or even to my soul, but I can’t let anything bad happen to my family,” Abraham declared selflessly. Abraham was amazed. He tried to fit this idea into his head, but it wouldn’t fit. He felt as if the whole universe were trying to pour itself into his mind, but it was overflowing right out the top and nothing was staying inside. He felt his whole being slipping away into nothingness – into something so much bigger than himself that it felt empty even though it was full in every way it is possible to be full. “My actions are eternal?” Abraham asked. Abraham considered this. “I do,” he answered. Abraham swallowed nervously as the implications of such a love expanded before his consciousness. He slowed down his car and allowed the car to his right to merge in front of him. “I see,” he said, fully aware of the depth of his choice, but not ready to declare his answer. The weathered car pushed through the traffic and past an intersection where two cars were blocking the right side of the road and causing the traffic jam. As they passed the two cars they noticed that there didn’t seem to be any major damage to either car. When Jesus Josephovich came out of the hacker’s apartment, the Oligarch was waiting for him in his private car listening to whatever noise passing for pop-music had been released on the radio that week. The driver opened the door for Jesus and he took a seat next to the intrigued Oligarch. The Oligarch smiled and directed the driver to take them back to Volodomir’s apartment. He assumed that the foreigner’s calm attitude was evidence that he had decided to join the Oligarch and his political machine. As he left the car Jesus Josephovich thought about all the good characteristics of his new friend and about how those positive things in his life, his tireless work ethic, business cunning, and substantial financial success, could help thousands of people around him if only he would get rid of the few blemishes in his character and ego that were holding him back from his real purpose in life. Jesus could honestly say that he loved him, especially when he considered his true potential. The Oligarch also considered the many positive things about the strange foreigner he had met, but he could only think about how he could use this man’s popularity to his own benefit, regardless of what might happen to the foreigner or to the larger community. He loved the idea of controlling a powerful ally. He really loved the idea of being in control. Jesus Josephovich headed upstairs to Volodomir’s apartment. He knocked on the heavy metal door and Volodomir’s wife Elena quickly opened it. She looked surprised to see Jesus Josephovich at the door, as if she had forgotten about their guest. “Oh, hello,” she said, letting him through the door, then quickly shutting it behind her to keep too much cold air from coming in. Compared to the wintery cold outside, their apartment was a sauna. “Are you alright?” Jesus Josephovich asked her, noticing her tenseness. She smiled meekly, and the foreigner began whistling a cheery tune. Suddenly her face turned grim and she almost grabbed the thin foreigner by the arm. “What are you doing?” she yelled. “You’re whistling!” she announced, as if it were an act of pure evil. “You can’t whistle indoors! It’s a curse!” she explained. “Oh yes,” he replied, remembering the Oligarch’s similar response. “That wealthy businessman told me the same thing.” The foreigner was amused that the wealthiest man in the country and a typical Ukrainian housewife would react the same way to the superstition about money. “If you whistle indoors, your money will fly out the window,” Elena declared with complete gravity. The fear in her voice told Jesus Josephovich that this was more than just an old Slavic superstition. It was connected to something that she was worried about right now. She pointed to a small gilded Orthodox painting of Mary holding her baby on the mantel. The style of painting was very old, and the images looked barely human, like a photograph that has aged so much it no longer resembles its original subject. “And about money?” Jesus inquired. Elena lowered her head in shame at her admitted selfishness, then grabbed Jesus’ hands. “When you were a child, did your parents give you everything that you asked for?” Jesus Josephovich wondered. “Maybe you were actually better off not getting some of the things you asked for as well,” the foreigner suggested. “Well, maybe I didn’t really need all the things I wanted,” she conceded. Elena opened her eyes wide. It was difficult to imagine that millions of dollars wouldn’t bring some sense of peace to her life. “What you’re really looking for is a sense of security,” Jesus Josephovich explained. “You hope that more money will give you that security.” He looked her straight in the eye. “It won’t,” he promised. “What is that?” Elena asked. “But how can God give me more peace?” she asked humbly. Elena stared at the foreigner for a long moment, trying to understand what he was saying. “Should we pray in the morning? Before we sleep? Should we pray before we eat anything, or just large meals? What about at celebrations? What am I missing?” she pleaded. Elena paused to consider this. “What is prayer then?” she wondered. “Always?” she asked with trepidation. Elena nodded shyly in agreement. “Do you think you are so far from Heaven that God cannot hear you?” Jesus Josephovich walked over to the window and opened it, letting in the freezing winter air. He looked up into the massive gray clouds hovering over the city. “I’m not sure I want to see that,” Elena confessed. Elena thought deeply about what the wild-haired foreigner had said. It challenged everything she had ever thought about the separation between her life and her religion. She slowly walked over to the window and looked up at the clouds. Not seeing any angels, she closed the window shut tight, double checking to make sure no cold air was coming through. She walked back to the kitchen table and sat down silently. She stared at Jesus Josephovich as he analyzed her expression. “Are you okay?” he asked once again.